UPDATE: A massive fire engulfed the roof of Notre Dame Cathedral in the heart of the French capital Monday, toppling its spire and sending thick plumes of smoke into the sky. "Everything is burning, nothing will remain from the frame," Notre Dame spokesman Andre Finot told French media. The 12th-century cathedral is home to valuable works of art and is one of the world's most famous tourist attractions. 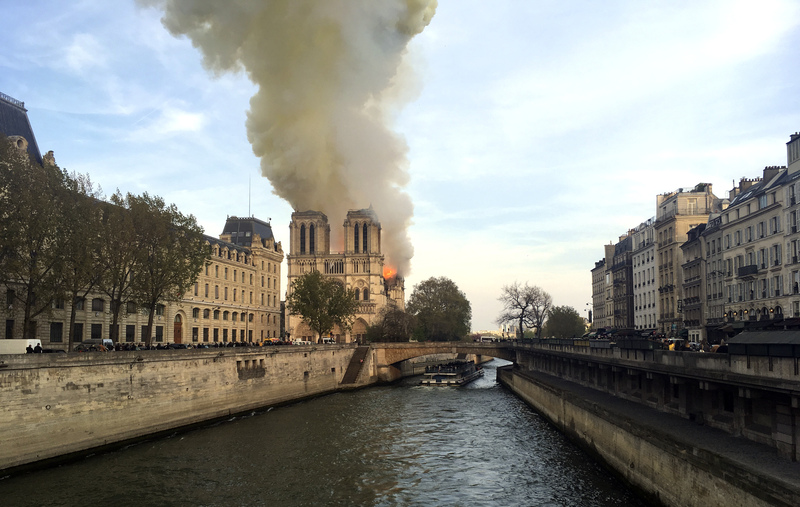 The cause of the catastrophic blaze was not known, but French media quoted the Paris fire brigade as saying the fire is "potentially linked" to a $6.8 million renovation project on the church's spire. Paris police said there were no reported deaths. PREVIOUS REPORT: Firefighters are battling a “terrible fire” at Paris’ famous Notre Dame Cathedral, says the city’s mayor Anne Hidalgo. French President Emmanuel Macron has postponed a televised speech to the nation because of the massive fire enveloping the beloved landmark. Flames are shooting out of the roof behind the nave as well as through the roof of the transept on one side. The sight stopped pedestrians in their tracks along the Seine River, which passes under the cathedral. Authorities say the fire could be linked to renovation work. The peak of the church has been undergoing a 6 million-euro ($6.8 million) renovation project. It’s unclear at this time whether anyone has been hurt in the fire. Ohno!! I really hope they get this under control. It would be terrible if such a famous thing completely burns down. I was heartbroken about this, I literally cried when I heard about it. That might seem weird, but the Middle Ages means so much to me, and if they don't fix this... That's a huge, beautiful piece of history gone forever. Let's pray that they get the fires under control and that no one gets hurt. at this present moment is Notre Dame Cathedral of fire?!!! oh I hope they fix this soon and get the fire out!!!! all that smoke is not good for people or animals! Oh no!! I hope they get things under control!! The fire is happening right now. That's horrible! I hope they can get it under control! I heard about this!!! There was an article on Instagram. Soooo sad. This building was so old!!! I read online that they were able to save the edifice and two bell towers. It is not a total loss. The ceiling, or at least part of it collapsed and the spire fell, but the stained glass windows and at least some of the artwork was saved. Also, the fires are completely out. WORLDteen will probably have an update later, just wanted to let you guys know. Notre Dame cathedral has survived rough things before. I think it will make it through. After all, it's survived this long... I see no reason why now would be any different. How did the fire start???? Is the Notre Dame the cathedral that Michelangelo painted in, or is that somewhere else? I can't remember!!!!! Does anyone know? no. I think that is this one .https://teen.wng.org/node/5120 .I THINK DON'T QUOTE ME ON IT! jup i think it is!! I believe Michelangelo painted the ceiling of the Sistine Chapel, in the Vatican, but he also designed the dome of St. Peter's. my gradparents were going to Notre Dame in when they go to Paris now they can't because of it. is so sad that it burned down it will take years before it is completely rebuild! i wish they could have stopped it before it the priceless artifacts before it burnt to the ground! I heard on KTIS this morning that it will take fifteen years to rebuild it. This is terrible, I really hope they are able to fix the broken parts. oh my mom forgot to renew the magizine and we mised it i am really upste that i msissed the World teen articuls that were in the magazine!!!! ok now i understand! !